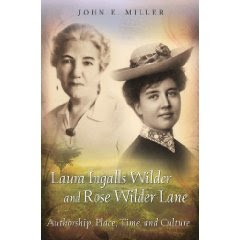 Laura Ingalls Wilder and Rose Wilder Lane: Authorship, Place, Time, and Culture, by John E. Miller, is a compilation of critical essays exploring the themes of place, time, and culture in the lives and writings of Laura Ingalls Wilder and Rose Wilder Lane. Miller first addresses the question of authorship, explaining that any serious assessment of the "Little House" series must begin with an understanding of the collaborative process between Wilder and Lane in the creation and development of the books, and then expounding on his interpretation of that process and the role each woman played in the writing and editing of the series. In terms of "place", Miller provides an interesting discussion on the significance of the differing attractions of both Wilder and Lane to houses. He then looks at "time" through a series of articles: an in-depth historical look at 1932, the year Little House in the Big Woods was published; a comparison of Wilder and Frederick Jackson Turner as frontier mythologists; and a look at an unpublished Missouri history written by Lane, compared and contrasted with Thomas Hart Benton's historical Missouri mural. Finally, the concept of "culture" as it relates to the "Little House" books is examined as Miller readdresses first the development of Wilder's writing skills through her experiences as columnist for the Missouri Ruralist, and then the controversy and criticism surrounding the treatment of Native Americans in Wilder's books. Miller concludes with thoughtful commentary on the political views of Wilder and Lane, and how these beliefs were (and were not) evidenced in their writings. This book is a welcome addition to the collection of scholarly critical works produced in recent years on Wilder and Lane. We recommend it for anyone interested in academic study of Laura Ingalls Wilder or Rose Wilder Lane.